En Francais, Automne-Hiver Chocolat Chaud. During the colder months in Paris the thing to do is to find a cosy place where hot chocolate is served. 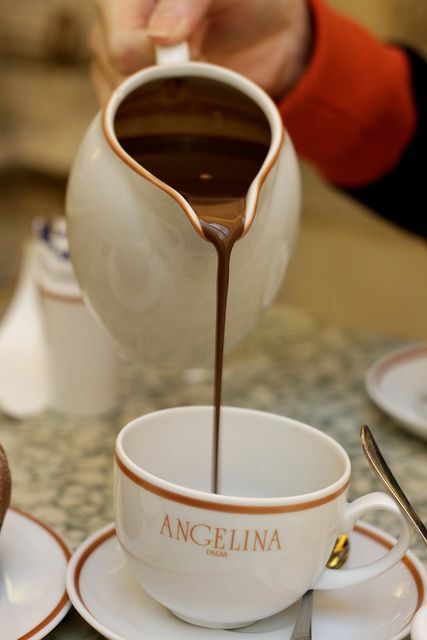 Angelina’s on Rue Rivoli would have to be the favourite amongst hot chocolate lovers. But it’s not the only place for a good hot chocolate. It’s funny, the French are reputed for serving up some seriously bad coffee but when it comes to serving up hot chocolate they excel, so much so that customers are willing to do some research into what makes a good hot chocolate such as that served in places like Angelina’s on Rue Rivoli or at Chocolatier, Jacques Genin. My own research has gathered that a good “Parisian” hot chocolate is made with milk and a couverture chocolate (Valrhona, Cacao Barry or Callebaut) and perhaps the addition of a spice such as Tonka, cinnamon or vanilla. The high quality of French or even Belgium couverture chocolate means you already have a texture that is what the french call “enrobing”, as it does that, it enrobes your tongue like silk to your skin. Couverture chocolate means you have a percentage of natural fat that is the cacao butter, therefore, using cream in the recipe is as Jacques Genin says, unneccessary. Here’s a few recipes I pulled together. I’ve translated this recipe from it’s origin, L’Express Styles – Saveurs – Recettes. The instructions are altered as I’ve added my own notes. 1. Bring the milk and water to boil. 2. Caramilise the caster sugar with the cinamon stick until the sugar takes on an amber colour. 3. While mixing, pour the milk/water over the caramel, do this in parts and not all at once. If the liquid has reached boiling point then remove from the stove to add the chocolate. Whisk. 4. Remove the cinamon stick/s, mix the hot chocolate with a hand held mixer. Feel free to add back the cinnamon sticks to infuse. 5. Serve immediately if you like the hot chocolate more a thinner liquide. Alternatively, if you like a thicker creamier texture then leave the hot chocolate on the stove on low heat. Stir every now and drink when you have your desired texture. Before serving I strain through a sive to get a hot chocolate liquid that is creamy and perfectly fluid. The hot chocolate is even better the next day! Milk has the minimum fat content you need to envelope the palette. Remembering we’re using couverture chocolate, 71% cacao percentage, this is what will give you that creaminess, desnity and fluidity. Bring the milk to boil with the vanilla grains and vanilla pod. Add the chocolate and whisk. Once boiled turn down heat and continue to stir until it thickens. Once thickened remove off stove and continue to stir. Don’t forget to remove the vanilla pod. Note: if you can’t get exactly 71% couverture chocolate, it’s possible to use a higher or low percentage of couverture chocolate, it really all depends on your taste (saveur). ← Diplome CAP reconversion en patisserie, I’m doing it.